Luna white is an easy to make and easy to enjoy wine kit! Vintner's Reserve wines offer excellent quality flavors and aromas. 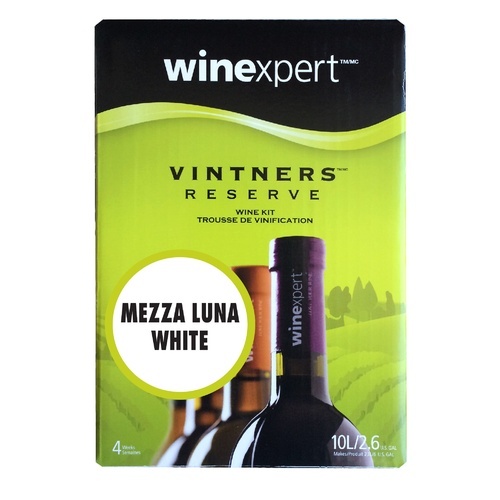 The flagship White wine of the Vinter's Reserve line, the Mezza Luna White is bursting with big fruit flavor and aromas. It is a rounded white, with a decent body and just enough of an oak character to balance the strong fruit flavors. I also used QA23 yeast with the yeast that’s included in the box. It turned out off dry but I was looking for bone dry like a Vintners, Mezza Luna white that I purchased in 2008. It may be due to the c-pack that I added after fermentation. It is rich in apricot & peach notes with a mild oak influence. When I reviewed this, it was right out of the carboy so it may need some time to mature. Overall, it will please those who enjoy an unoaked Chardonnay and a semi-dry Riesling. Everyone has enjoyed this light, not too sweet white wine. I'm ordering another kit now. I was basically expecting this to be a blend of white wine to make a dry table wine. However, upon receiving the kit, I saw it came with an F-pack. So, the finished product is slightly off-dry, but still tastes decent upon bottling. I don't like sweet wine, so was worried about how it would turn out. Not sure if I would purchase this again. I'll be able to decide in a few months once I start drinking this.